Heat 5-quart Dutch oven over medium heat. Add bacon; cook 8 to 10 minutes or until crisp. Using slotted spoon, transfer to paper towel-lined plate; reserve. Reserve 1 tablespoon drippings in Dutch oven; discard the rest. Season chicken with 1/2 teaspoon of the salt and the black pepper. Add to Dutch oven; cook 8 to 9 minutes, turning once, until juice of chicken is clear when thickest part is cut (at least 165°F). Remove and reserve. Add onions, mushrooms and remaining 1/4 teaspoon salt to Dutch oven, and stir to coat; increase heat to medium-high, and cook 5 to 6 minutes or until onions are just starting to brown. Stir in garlic; cook about 1 minute or until garlic is fragrant. Add wine, broth and chicken; return to simmering. Reduce heat to medium-low; cover and simmer 8 to 10 minutes or until onions and mushrooms are tender. Remove chicken to serving platter; cover with foil. In small bowl, mix flour and softened butter; mash with fork to form a paste. Beat butter mixture into wine mixture in Dutch oven with whisk. Simmer about 3 minutes, beating constantly, until paste is completely dissolved and broth has thickened. Spoon sauce and vegetables over chicken; garnish with bacon and parsley. White button mushrooms can be substituted for the cremini mushrooms in this recipe. Serve this over rice or with mashed potatoes. This dish dates back centuries ago and has been a longstanding staple in French cuisine, but it became popular in the United States when American chef and cookbook author Julia Child introduced it in her cookbook Mastering the Art of French Cooking. 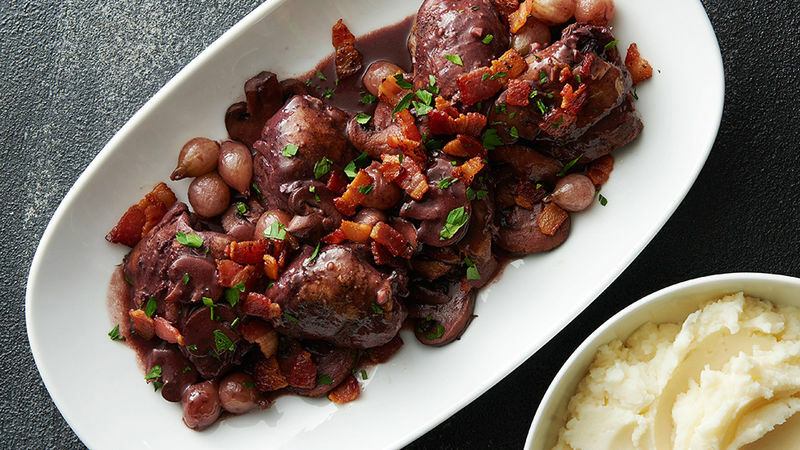 Slow braising is the technique that makes traditional Coq au vin melt-in-your-mouth delicious, but this simplified version uses tender chicken thighs that gets the job done in a fraction of the time, perfect for your weeknights and special occasions. Chicken thighs make this recipe easy. See what else you can do with your favorite protein with these delicious chicken dinners.